How do I determine the right sample size and acceptance number? 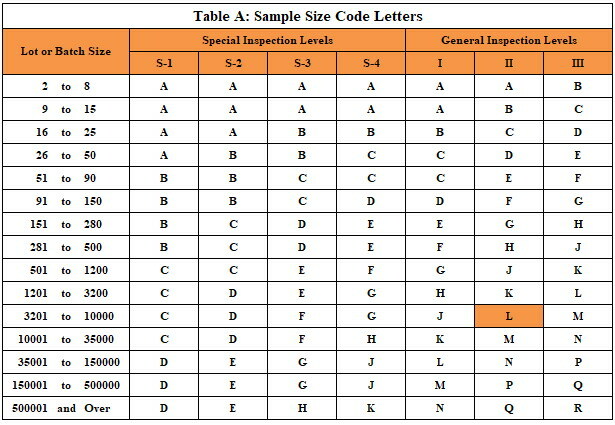 As an example, in an inspection of a 6,688 unit lot, with an Acceptable Quality Level of II, Table A indicates that sample size code letter should be "L" . 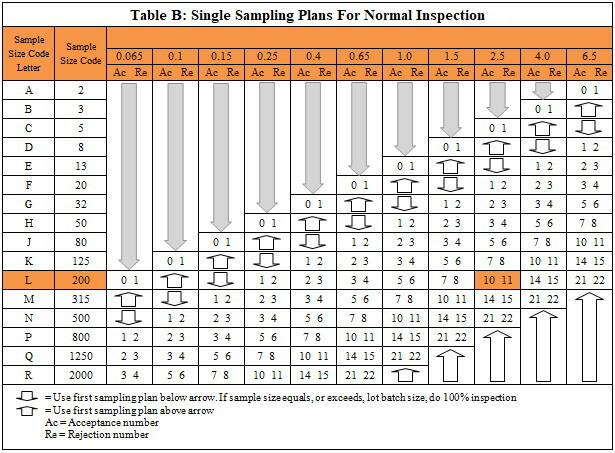 Table B indicates that the sampling size of "L" should be 200 units. For an AQL of 2.5, the corresponding acceptance number is 10. If the number of defective units is higher than 10, the lot should be rejected. It also means that, if the lot passes inspection, there is a 95% chance that less than 5% (10 defects in this example) of the entire inspected lot will be defective. What should I do with defective or discarded lots? Defective items found as part of 100% inspection can be discarded, repaired or replaced. You may opt to buy the discarded lot at a discount for resale at a lower price.